Matisyahu's "Happy Hanukka"-Jam Along is a wonderful holiday app with lovely illustrations and fun music for children to enjoy. Great for music lovers. 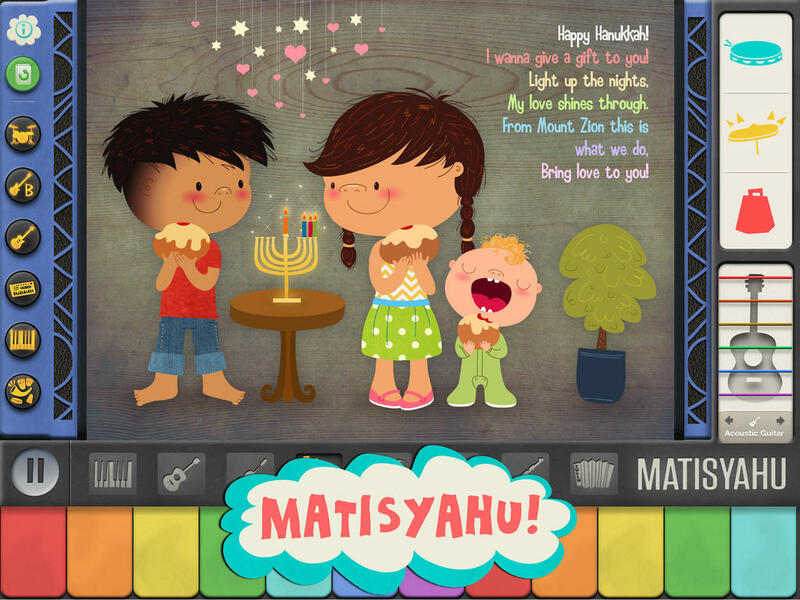 Matisyahu’s “Happy Hanukkah”Jam-Along is another one of our featured apps in our Christmas & Holiday Apps For Kids post. This app features the song “Happy Hanukkah” and allows children to explore a variety of instruments and sounds as they follow along with the song. With a similar set-up as Santa’s Merry Band, this has great visual and audio appeal and is great for children who love music. This app has many of the same characteristics as Santa’s Merry Band with the lovely illustrations, great song quality, and words for children to follow along. The variety of sounds for children to explore is great and the developers have incorporated an easy to use interface as well. Overall this app is very well done. Matisyahu’s ‘Happy Hanukkah’Jam-Along offers many ways for children to have a bit of fun with different instruments. They can add their own flavor to the song by incorporating the piano, guitar, violin, and many more or they can choose to remove certain sounds/layers of the song to see how that changes the sound which is fun to do. While this app offers a lot of ways to play with different instruments, there is only one song for children to explore which limits the entertainment value a bit. Priced at just under three dollars, this app seems to be a bit overpriced for only having one song to explore. There are many musical instruments and sounds to play with, but only having one song included makes it a little difficult to make up for the price. Children may quickly lose interest due to the one song as well. Great for young children, this app is easy to use and safe too. The developers have made sure that each instrument can be played easily and children can simply tap and touch various sounds they want to take out of the background music as they explore. Parents can also rest assured knowing there are no external links to be concerned with and the “parent” area is protected. TSC Music is a utility app that will enhance your music listening experience, check and monitor your hearing levels, and perhaps even improve your ability to hear sounds in certain frequencies.